Sister Claire Schmitt was born in St. Martin, MN, at home. She was the third oldest child, and had a twin sister who died at the age of 57. She had five brothers and six sisters. “The whole town was Catholic, as well as those on the farms. This was the most Catholic county in the world.” Two men were the elementary school teachers in the school she attended. Although a public school, religion was taught every day and prayers were said in the morning, at noon (the Angelus) and at the end of the school day. Despite her lack of contact with sisters in school, Sister Claire had an aunt who was a sister at St. Benedict’s Monastery, only 22 miles from where Sister Claire lived. This aunt played an influential role in Sister Claire’s decision to enter religious life. Sister Claire, recollecting that she had always had the desire to become a sister, describes how she, along with two of her sisters, went to work at St. Benedict’s as floor cleaners. It gave them the opportunity to observe the sisters more closely. They did this and eventually attended high school as aspirants, with the future intention of entering the new community in Bismarck. When the document from Rome permitted for an independent community to be formed, Sister Claire finished high school in Bismarck and completed her years of initial formation in that community. After completing the postulancy and novitiate, Sister Claire attended the diocesan Teachers’ College in St. Paul, MN, to receive the necessary training in teaching. 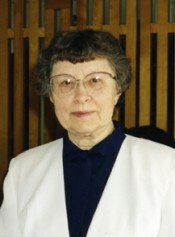 She subsequently went on to teach at St. Joseph’s in Mandan, St. Mary’s and Cathedral in Bismarck, and St. Joseph’s in Dickinson, as well as other locations. Most of her teaching has involved the upper elementary grades, but she has also taught English at the high school level. Sister Claire taught religious education, has served in parish ministry and has served at the University of Mary Learning Skills Center and at Garrison Memorial Hospital, working in pastoral care and serving as a driver. She has also done work in home care, including caring for her own mother when she needed care. The variety of skills and experience Sister Claire developed during her years of teaching and ministry was put to use in a remarkable way. When the Alliance for International Monasticism (AIM) sent out a request for English-speaking teachers to teach English as a second language to sisters at Mtwara Secondary School in Tanzania, Africa, Sister Claire volunteered to go. Sister Claire says of her 18 students, “It took a long time for them to catch on to the English, but once they did, they were eager to learn.” While in Tanzania, Sister Claire experienced many delightful ceremonies, tours, and cultural experiences. Undoubtedly, it was the experience of a lifetime for Sister Claire, and for her Tanzanian students. Sister Claire is now retired. A skilled seamstress, she is sought out by the sisters when tailoring and alterations are needed for clothing. Out of laminated cotton, she sewed many school bags which Sister Helen Kilzer filled with school supplies and sent to children in Afghanistan. Sister Claire enjoys this work, as well as doing craft projects that involve sewing. In the past she has made quilts, and now is beginning work on fabric purses, a gift-shop item that is both decorative and practical. Although no longer active in outside ministry, she continues to use her gifts and skills to serve others.